What Is It With NBC's First Read and Polls? I had the chance to talk with Fred Elbel, executive director of Defend Colorado Now, this evening on John Andrews's Backbone Radio. DCN is sponsoring a petition drive for a ballot initiative that would prevent non-emergency state services from going to illegal immigrants. It's pitched as part of the overall solution - not the entire solution itself - and it makes sense. I'll find time to trundle down to their downtown office sometime this week and sign the thing myself. Still, part of Mr. Elbel's pitch disturbed me. It's undoubtedly true that illegal immigrants are costing the state a ton of money in services. But Mr. Elbel also said, and I'm paraphrasing here, that the only beneficiaries were the businesses that hire them. That's obviously untrue, and it's so obviously untrue that it requires a response. Businesses compete. They compete on price and they compete on service. But for many services, they compete on price alone. 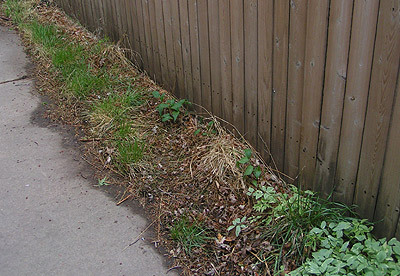 Lawn-mowing and gardening services, housecleaning services, for instance, compete mostly, although not exclusively on price. Which means that lower labor costs are not a sustainable competitive advantage. Which means that if Colorado wages really are being affected, it can only be because consumers are paying less for those services, as well. This translates directly to an increased standard of living. If I can make more after taxes in an hour than it costs me to have my house cleaned, I'm better off working that hour than cleaning my house. If, on the other hand, it costs me more to have my house cleaned, I'm better off cleaning my house myself. Likewise mowing my yard, washing my car, or pretty much any other service. And with the money left over, I can either save or buy things. In short, it's not amorphous "businesses" who benefit, at all. In the long run, they're no better off than before, although they no longer have the option of going back to higher-priced labor unless they cater to a specialty market. It's consumers and homeowners, because they pay less for services that free up their time. And honest accounting of the effects of illegal immigration needs to include this basic economic fact. This logic, and this rhetoric, are eerily similar to those used to demonize Wal Mart. If free-market conservatives aren't careful, they'll find they've won one debate, but on terms that guarantee them losses elsewhere. UPDATE: Welcome Instapundit Readers, and feel free to take a look around the site. The GDP boomed, conusmer sentiment (a different survey from consumer confidence) held, and the Purchasing Managers' index showed continued strong growth. Despite the strong housing market, MSNBC still found time to quote USA Today as saying that the "strong housing market is slipping." UPDATE: It also occurs to me that long-term interest rates have been inching up lately. This is both good news and bad news, but it's always spun as bad news. When the yield curve briefly and narrowly inverted, there was a great deal of talk about recession. Now that long-term yields have edged back up over short-term rates, the talk is of the effect on mortgages, even as the recession indicator has receded. MSNBC's First Read continued its obsession with gas prices to the exclusion of, well, all other economic news this past week. A rough word-count of economic reporting on First Read's blog shows that of 3500 words devoted to economics, 3250 were about gas prices. This does not include a Monday posting ostensibly about the Dahab bombing that spent the second paragraph talking about oil prices. Asked in the April 21-24 NBC/Wall Street Journal poll who is most responsible for high gas prices, 37% of those polled say the oil companies are most responsible. Oil-producing nations rank second at 22%, while only 15% lay the most blame at President Bush's feet and 4% say Congress bears the most responsibility. ...unstable relations with Iran and political instability in Nigeria seem to be the primary drivers of the price of oil. Gee. I wonder where people are getting this idea that ExxonMobil is wearing the oil-soaked black hat here? Last week, we noted how MSNBC's First Read blog had reprinted the New York Daily News's misquote of a CNN poll about how oil prices were affecting families. In the poll, 23% said that gas prices were having a "severe effect," 46% said they were having a "moderate effect." The Daily News and First Read both reported 69% under the "severe effect" label. On Tuesday, we quoted a New York Daily News article, which cited a CNN poll showing that 69% indicate gas prices are causing them severe hardship. However, the actual poll finds that 69% say these prices are causing them "hardship", not "severe hardship." To their credit, the correction was given about the same prominence as the original report - at the end of their long, daily commiseration about gas prices. It's not a perfect correction; they probably should have noted the difference between "severe" and "moderate," for instance. But Ms. Wilner replied promptly and without attempting to make excuses. I saw United 93 this morning, and my guess is that director Paul Greengrass won't be getting a lot of plaudits from the Academy. He's done too good a job. These are not impersonal airliners striking from nowhere. This plane - and by extension, the others we don't see the interiors of - are hijacked by real people, real, malevolent people with faces. A couple of points stand out. First, the military was consistently behind the loop. There was virtually no communication between the military and civilian air authorities. NORAD was continually tracking the wrong planes, planes which were down or had already crashed, or had already been confirmed as not hijacked. They didn't even know United 93 was hijacked until after it hit the ground. They're gamely trying to improvise, without weapons, without clearance, without planes, without information. Civilian authority was similarly handicapped for precious minutes by simply disbelieving what they were seeing. The Newark Tower is staffed by trained professionals with a clear view of Manhattan, but they didn't see the first plane hit because they weren't looking for it, which is as good a metaphor for the government response that day as any. With no US hijackings in over 20 years, the hijack desk isn't even manned. Since nobody sees the plane hit, nobody's sure initially 1) what happened to American 11, and 2) what caused that big hole in the North Tower. You hear controllers saying, authoritatively, "nah, they wouldn't fly a plane into the WTC." They, like the passengers on the other flights, and the European man on 93 who had been through a hijacking before, were relying on past experience. You also realize how much the United 93 passengers gained from their hijack crew being shorthanded. With two men in the cockpit, that left only two hijackers free to try to keep the passengers cowed. One of them was constantly running back to talk to the cockpit. So not only couldn't they see all the passengers on the air phones, they also couldn't keep the stewardesses from seeing the pilots' bodies, tipping off who was flying the plane. A fascinating touch comes at the end of the film, when Greengrass cuts back and forth between the passengers saying their prayers before launching their counterattack, and the hijackers saying theirs in the cockpit. There's no moral equivalence here, though. I don't know Greengrass's religion or politics; I do know that he understands there are good guys and bad guys and who are who. As in any historical picture based on real events, you know how it turns out. You find youself seeing people making plans for after the flight, next day, next week, next month, and remind yourself that you know what they don't. In spite of that, you're rooting to the very end for the passengers to win. There's nothing cheap or maudlin or sentimental about the ending. The focus remains on the passengers, from their point of view. One other patron after the film complained that because the film was so factual and real-time, we never really get to know any of the hero-passenger, the four guys who put aside their fear and put together their response. That they could have been developed more fully as people. I disagree. The passengers were more or less strangers to each other, so why should they not be strangers to us? We know what we need to know about them, and that's enough. This site was temporarily off line this morning as part of a denial-of-service attack by Saudi Jihadists, possibly against an Israeli site, also hosted on Hosting Matters. While disappointed that I wasn't the target of the attack, I'm glad to be back on line. I read Michael Lewis's Moneyball the other week, and one of the first things that came to mind was a comparison to investing. Moneyball explores the Oakland A's search for better cheap talent through market inefficiencies. They discover these inefficiencies by sifting through massive amounts of data, and by, in effect, playing a different game from everyone else. The look for correlations between statistics and runs - in their case, on-base percentage and slugging. They also do something really funky. They calculate the value of everything a player does - ever batted ball, every fielding play, every pitch - in terms of how much that play made his team more or less likely to score in that game, and then add them up. Nothing matters but outs and runs. Get enough runs, forstall outs long enough, and wins will follow. That's playing a different game from everyone else. They are the quant funds of baseball. Compare them to the Atlanta Braves. Boys not born the last time someone else won the Braves' division were complaining about getting fountain pens last year. They rely on traditional scouting, trying to project what a player can become, looking for them one gem at a time. The Atlanta Braves are the value investors of baseball. Compare them both to the Red Sox & the Yankees. These guys have money to burn, they frequently try to buy whatever proven talent is out there, often overpay for it, and often don't keep it very long. They'll break teams apart, change management with glee, raid weaker & poorer teams for their best players. The Red Sox & Yankees are Carl Icahn and T. Boone Pickens. The interesting thing is that you can win both ways, and you can make money both ways. And what's more, you can find lots of different types of value, and you can and you can find lots of different quantitative inefficiencies. As part of my research last year, I interviewed three different quant fund managers, and know of a couple others. They each do something different, and they each consistently beat the market. Finally, you can also make a lot of money turning around failing enterprises and buying up juicy bits of your competitors. But it's a lot of work running the business. I finally got mail confirmation from the county party that, following a family tradition (see left), I will be a delegate to the State Republican Convention on May 20. Uncle Joe and I actually had a number of - spirited - political conversations when I was 14 and helped in my own small way to get Ronald Reagan elected President. Naturally, since the convention is on Shabbat - even a local evangelical minister couldn't understand why they couldn't do these things on Sunday - I'll stay there in a hotel nearby, so I'll get a chance to file a report Saturday night. Also, apparently the state party charges Denver $15 a head for its delegates for some reason, so I'll need to send a check there. Am I the only one who thinks it's just a very little dumb to put the County Republican HQ on Birch St.? Didn't Bill Buckley work very hard to get rid of those guys? Maybe this was raucus stuff in '42, but honestly, I like the song better than the cartoon. Still, the impressive thing weren't that it were done well, but rather that 'twere done at all. The New York Daily News says the same CNN poll showing Bush's approval at 32% also notes that 69% "said gas prices were causing them severe financial hardship." Sixty-nine percent of Americans in the CNN poll said gas prices were causing them severe financial hardship. Take a look, though, at the actual poll. Forty-Six percent say gas prices have caused "moderate hardship," while only 23% say "severe hardship." In effect, both the Daily News and Ms. Wilner triple the number of people reporting "severe hardship". At least it wasn't their own poll they got wrong this time. Meanwhile, First Read, now posting throughout the day, fails to mention today's buoyant consumer confidence numbers, which would tend to contradict the claim the gas prices are forcing people to take second jobs. So why the discrepancy? Probably because gas prices are the one price that everyone knows, because it's posted on every street corner in America. As you drive by the sign, you're literally coming closer to having to pay that price. Gas prices are a lower percentage of total household expense than ever, but gas consumption is something that usually takes some major change to affect. So any change in price gouges into that always-thin margin between the red and the black. I realize that First Read is primarily political, not economics, but they're clearly letting their political biases get in the way of their economic fact-checking. Jed Babbin sat in for Hugh Hewitt yesterday, and in commenting on American Dreamz, a new movie that makes fun of both Preident Bush and suicide bombing? Babbin seemed offended that the war would be a fit subject for humor. Of course it's a fit subject for humor. Maybe not the American Dreamz type, but making fun of things is what Americans do best. Just before we entered WWII, Spike Jones released a song, "Der Fuhrer's Face". It was turned into a Donald Duck cartoon. It's a riot, even now. Mark Steyn pointed out a couple of years ago that Hitler would be pleased to see his works banned in Europe, and mortified to see a Broadway audience laughing at him. If Neil Young spent less time writing bitter, anti-American songs and more time writing the next "Der Fuhrer's Face," he'd be contributing a lot more to the effort. As Captain Kirk once said, "No, quite The contrary - I take this mission very seriously. It's you I take lightly." Trent Lott was just on Sean Hannity explaining why every time he opens his mouth he gets further away from succeeding Bill Frist and closer and closer to being the ranking minority member on whatever committee assignment he gets. Look, I know gas prices are high. I pay for gas, too. But to try to argue that there's collusion at the highest levels because when you drive down the street, the prices are all near each other must be to come from a state that can see oil wealth but didn't have enough sense to lure it across state lines. Oil and gasoline are commodities, meaning that they compete on price, that there's no basic difference between the competitors. Once again, it needs to be said that the oil companies don't set gas prices. Lott also played the robber-oil-baron class-warfare card. Has he actually bothered to do the arithmetic? Does he really think that if every oil company CEO worked for $1 a year it would save me more than that dollar over the whole year? Second: you, too, can share in the wealth by buying oil company stock. These stocks pay dividends. The Dow Jones US Oil & Gas Index is up something like 35% over the last year. Over the last 3 years, it's up about 100%. If you want to shield yourself against the high price of gas, maybe think about buying oil stocks, and sharing in the wealth. No, I didn't do that, I'm afraid. But then, I'm not whining about greedy profiteering, colluding oil CEOs, either. But something, some virus, has my immune system responding in overdrive. 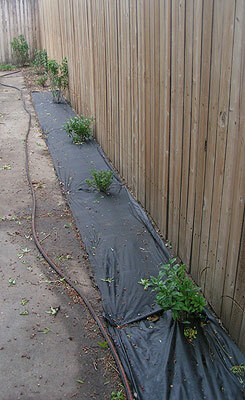 It kept me off the radio yesterday, and kept me from finishing off the gardening project. Of course, the soak hose is part of the sprinkler system, which the maintenance guy is coming to look at tomorrow morning. Fortunately, just as my buying a condo was enough to burst the late-80s DC housing bubble, my planting lilacs was enough to bring on a hail storm last night. Krista Kafer & I will be joining John Andrews again this Sunday as co-hosts for Backbone Radio from 5-8 pm Mountain Daylight Time. We'll have an hour-long discussion with Angelo Codevilla, the Prince of Darkness when it comes to the War on Terror. Codevilla's a frequent contributor of well-researched and persuasive doom-and-gloom when it comes to the war to the Claremont Review of Books. Of particular interest is a Fall 2002 symposium on his views, along with his response. Sandy Froman of the NRA will be on to discuss 2nd Amendment issues. Here's a copy of her speech to the NRA convention last year in Houston. Larry Donnithorne, who's written a book on why West Pointers tend to end up running so many corporations, The West Point Way of Leadership, will be on discussing why higher education can't seem to get it right. My own recent b-school experience suggests he's right. And the GOP challenger in the 3rd Congressional district - a chance to return a blue district to red hands this fall - Scott Tipton, will be on hand as well. UPDATE: The link to the sound file has been fixed. Passover is really hell on blogging. I'll be missing the next two days for the end of Passover, the last two days of which (one day in Israel) are a non-work holiday. Great for spiritual and religious development. Terrible for billable hours. Terrible for blogging. It appears as though the occasional co-hosting gig on Backbone Radio has grown into some more-than-occasional, semi-regular at least. In any event, I'll be back on this Sunday with John. As soon as I have the guest list, I'll pass it along. You go to b-school, you get not one, but two degrees, and then you spend a year doing the same damn thing waiting for a position to come along. Well, what better way to celebrate May Day than to begin work at a brokerage? That's right. On May 1, I make the long-awaited leap from programming into finance, joining Wm Smith & Co. as a research analyst. Naturally, I've got about 400 clients to wind up by 4/30, and I still have one contract to deliver on over the summer, plus I'll still be available to set up the occasional blog for people. But basically, I'm switching careers. Let me tell, you, at 39, even in your first year of being 39, it's not easy to switch careers. Entirely too many HR people have already decided that your corners have been forever chipped away from 20 years of being repeatedly pounded into that round hole. Too many others simply assume that work experience, if it's not industry-specific, doesn't count. They might be willing to give you a chance, on the assumption that you should be willing to work for a 21-year-old's wages. It's exciting to find a place that doesn't think that way, where the company's always looking for new ways to apply new ideas, and where I'll get a chance not just to write reports, but also to contribute to the business, as a business. I've been trying to get away from programming practically since I started. The problem is that for 10 years, I spent time with a variety of government contractors. Now the government analysts weren't making a whole lot of money, so the only real compensation they had was the fun of doing the analysis. They contracted out the programming, much as the Army contracts out the washing & cooking. The last 10 years of web programming was largely a surrender to circumstance, the price being that I managed to get paid better for it. Full disclosure: the initial connection was made through Marc Holtzman, candidate for governor, lest anyone accuse me of harboring secret sympathies or having made some sort of deal. In any case, Anyone who's actually had to find work, which immediately disqualifies most government workers and political activists, already knows that nobody "gets" you a job. Hopefully, this will also mark a shift in blogging from mostly politics to mostly business and finance. I won't be abandoning any topics, just changing the mix to more vodka and less orange juice. Co-hosting the show this evening was a blast. Here's a list of relevant links to tonight's guests, for those who'd like to read up. A fine roundup of current Kelo-busting legislation and referenda around the country can be found here. As John mentioned, the link to register for updates is over there on the left. Thanks for listening, and Happy Passover and Happy Easter as appropriate. I'll be riding shotgun, along with fellow LPR classmate Krista Kafer, this evening on John Andrews's Backbone radio, on AM 710 for those of you near Denver, and at 710knus.com for those of you elsewhere. We'll be talking about Passover, Easter, and Immigration. And we'll also be talking about taxes and other forms of government extortion. As a teaser, while we won't be talking to Jeff Cornwall, he's a got a roundup of post-Kelo efforts on eminent domain at the state level. The NBC/Wall Street Journal poll and other surveys continue to show that Americans have little appetite for extending the tax cuts in the face of more pressing domestic concerns -- including energy prices. The poll contains exactly two questions about taxes. By a 49-29 margin, respondents said they were more likely to vote for a candidate favoring "making the tax cuts of the past few years permanent." And by a 56-39 margin, respondents support the tax cuts (Question 18). Gas prices do not show up on the list of questions. The only support for Wilner's comment is that by a 49-19 margin, people asked are more likely to vote for someone who "emphasizes domestic issues over military and foreign policy issues," leaving those issues completely unspecified. By the way, "favors tighter controls on illegal immigration" wins 71-11, the largest more-likely/less-likely result of any split. Somehow, that little nugget didn't make it into their analysis of the political dyanmics of the immigration debate. Passover is, in fact, the most Jewish-centric of our holidays. It's the holiday that commemorates when, under the pressure-cooker of a midnight escape, we became a people, a nation, rather than a rabble of slaves. It's a holiday where we leave tyranny for the - as yet undefined - servitude to God. The irony is that of the rabbis in the discussion, all but one are either converts or descended from converts. The other is a Levi, and tradition holds that the tribe of Levi didn't suffer under slavery the way that the rest of Israel did. The question here isn't one of conversion per se, something better dealt with in Ruth,/I>, but one of applicability. Outside of Judaism, the Passover Story is someone else's, not applicable at all. Inside of Judaism, the Passover Story is their own. So much so, that it's their discussion that we study Seder night. Sometimes, months go by without seeing an interesting house. This week, I saw two. Take a look at the following filmstrip. As always, click to enlarge. First, it's obvious that someone got a memo about having more American flags. Still a fair number of Mexican flags, but many more American ones, most of them right-side up. (I will also note that the reporter from the CBS Colorado Springs TV affiliate thought that was, "pretty funny.") 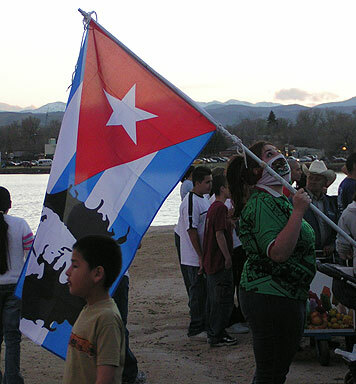 Also, note the waiting-for-Guantanamo garb of the woman holding the Cuban flag defaced by Che. 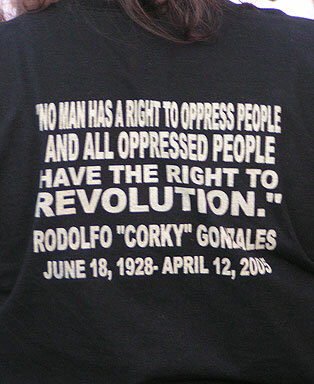 There was also a fellow wearing a t-shirt with pre-1845 Mexico, that read, "Reoccupado America." For some reason, he declined to be photographed. You won't see those pictures on the evening news. Most of the people out there weren't interested in la Revolucion, but this is how movements get hijacked. If this really is a nascent political movement, it's important that it not be run by these people. 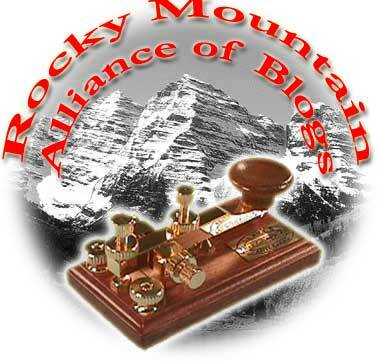 Slapstick Politics, a Colorado conservative Latino blog, has more. Forty-ninth just sounds more dramatic. Union activists in at least nine other states - Arizona, Louisiana, Nevada, Florida, Pennsylvania, Idaho, Tennessee, Illinois and Utah - apparently agree. By one survey or another, all claimed to be 49th in 2004 or 2005. But Franks and others argued that the Legislature had to set priorities, and education should be the No. 1 priority. "Is it practical for us to be 49th in education funding?" Franks asked. There is not as much money per pupil as before. This occurs at a time when Ontario's funding for education stands 49th in North America. Gee, with 50 states and 11 provinces, not counting Mexico, you'd at least think they'd have been imaginative enough to make it 60 out of 61. Welcome to the Education Establishment. Where all the unions are strong, the statistics are good-looking, and all the funding is below-average. Seen on a teen-age t-shirt in Cherry Creek: "Music is the Weapon of the Future." Some people never learn. On the other hand, maybe she just meant that by playing it loudly enough, they can force us all indoors. 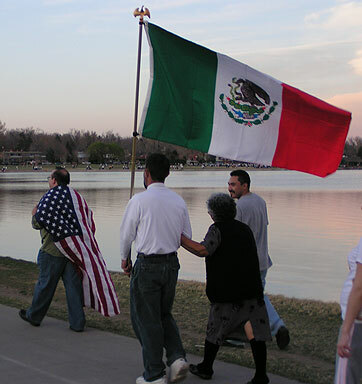 Denver's contribution to tomorrow's schedule of pro-illegal immigration events is a candlelight vigil at Sloan's Lake. Ostensibly to memorialize all those who've lost their lives trying to get into the country. Frankly, there's nothing funny and something moving about people willing to risk the lives they have for a better one. But somehow, I don't think they're going to be protesting in favor of a wall and organized entry points. There's also something not so funny about one of the more, er, irredentist sponsors of tomorrow's "Take Back the Southwest" event. On the other hand, there is something funny about that april10.org map. Apparently, one of the more shadowy parts of the Aztlan plan is to annex northern Utah to Colorado. Just what we need: three or four more counties without any water. UPDATE: In response to the question about the movie, it's hard to tell without seeing it, but it looks like there's both good and bad, according to the description. First, I know of no situations, that is to say, none, zero, zilch, nada, where the Minutemen or private landowners are using illegals for target practice, picking them off if they happen to drift over the property line. Immigration has been a hot topic for over a year now, and if someone were actually doing this, we would have heard about it. The media who caricatured the Minutemen as trigger-happy vigilantes would have made sure of that. In fact, the one situation I do remember hearing about was a fellow who picked up some illegals, tried to detain them (not kill, mind you, detain), and then sent them on their way with some cookies and blankets. He was, as I recall, arrested for kidnapping. A movie that takes as its premise the idea that private border-snipers are picking up jobs from newspaper want-ads is asking to be treated as propaganda. The premises have to be realistic. This is how the movie is characterizing itself. If I've got the wrong impression, many others probably do as well, and they'd do well to correct their website. That said, the guys running minivans up and down the highway, or worse, running moving vans without ventilation are barely human. And if there are land barons using border-front property as a hook for human smuggling, that's where I'd put up the wal first. Very popular among Republicans and Democrats pushing for immigration reform is the notion of business sanctions. There's this hotline, run by the government, that companies can call (even franchise restaurants in Denver, ahem) and see if a given Social Security number is valid. The idea is that if business owners can't be bothered to call that number and check on applicants, they should be fined, then jailed, and then presumably have their businesses confiscated a la Kelo. It won't help, but it sure sounds good. The problem is that Social Security numbers are traded around among illegals like steroid needles in a baseball clubhouse. A business can call the highly-organized government, which operates with ruthless efficiency and incorruptibility, and get a "yes" on a number that's been used by everyone else out there picking grapes, too. A friend of mine once checked on a number for a janitor, and it reported something like $4 million in income the previous year. If the system for keeping these numbers doesn't work now, is that efficiency going to be improved by the agency's knowledge that someone else is going to take the fall if they keep getting it wrong? And if businesses aren't held responsible for a system they don't control - certainly a reasonbale approach - then why should they press to clean up this mess? In the end, it becomes nobody's problem. Worse, it stays in nobody's interest to fix. Not the bureaucracy, which collects taxes regardless, and is relatively immune from punishment for anything short of actually trafficking in illegal SS numbers. Not the businesses, who can get off the hook by calling a phone number virtually guaranteed to give them fraudulent information. Not the politicians, who can claim to have made "tough enforcement" a priority. And obviously not the illegals themselves. This is a somewhat older book, from a few years ago, by Richard Miniter. He argues persuasively that you can't win by buying customers. Those customers aren't worth it. It's a good book, with some historical perspective, and a lot of good recent examples. As countless dot-coms, their VCs, and three large car companies have discovered, buying customers is a lousy business plan. Put that way, it seems intuitive, but not until Richard Miniter's short but powerful little book, The Myth of Market Share, had I seen it put that way. Most journalists, most bureaucrats, and too many businessmen operate under the delusion that market share is the royal road to profits. In fact, what matters to investors - and therefore, what should matter to management - is return on investment. Measured by return on capital, market leaders are often not profit leaders. Why not? Doesn't a large market share mean control of the market, and this, according to Porter's Five Forces model, mean substantial pricing power? Isn't pricing power the whole point of market share? Evidently not. Miniter is positing that nobody has pricing power, at least not outside normal economic cycles. Then, the marginal customers whom you end up buying are rarely loyal, and have a lower profit margin, Having been bought by low prices, they are the kind that will desert you for them, as well, meaning that you can never raise prices on them in the presence of any competitors. Moreover, by training consumers to buy only on price, they're commoditizing products that can and should be sold on reputation. Cars and clothes are two of the more obvious products whose nameplates and labels should carry connotations of class and quality above and beyond the mere cost of their manufacture. If Chrysler wants to try to hang on to customers by tossing 100 years of brand equity out the window, they're going to find themselves without either. Even the companies that make progress through lower prices, notably Wal-Mart, do so not because of their non-existent pricing power, but because of their power as consumers. This is almost always the determinative force: even the trusts were losing their market share by the time they were broken up, and that the prices for their products (steel, oil, sugar, rail carriage) all continuously dropped during their existence. So where did this idea come from? Miniter claims that it probably arose as a correlation between growth and profit after the Civil War during the time of the trusts. I'd place it on another phenomenon Miniter doesn't mention: the company town and company store. True enough that abused their captive markets, but those conditions are hardly repeatable. Then there's the difficulty of defining your market. One of Porter's Forces is the threat of substitutes, and companies frequently fail to take that into account. Smart CEOs can use this to their advantage. Jack Welch only wanted GE in markets where they could be number one or number two, but then made managers define those markets in such a way that they never had more than 10%. This suggests that market share can used as a metric, rather than a goal. This (as any honest advocate of affirmative action will tell you) is at the least a very tricky balance to maintain, but it may be worth considering in some cases. Miniter basically eschews measuring yourself against your competition in favor of measuring yourself against yourself, and in doing so, echoes the recent advice in a number of business best-sellers. Organic growth is better than growth through purchase (Deals From Hell). Focus on customer service, and what you love and can do best (Good to Great). It's sound advice, and this book can help both managers and potential investors keep that in mind. Powerline may indeed have dismembered the Mearsheimer & Walt "study" purporting to show that you can't spell "neocon" without "J-e-w,"
If there were a referee, he'd stop the fight. If this were a Little League baseball game, it would have been called long ago under the ten-run rule. I think we can officially proclaim this the most one-sided intellectual debate in history. Mearsheimer and Walt have been reduced to rubble, and that was by Scott's initial post on the subject. What's happened since is almost too painful to contemplate. Rubble it may be, but it's the rubble of a nuclear power plant. The toxins will be poisoning the atmosphere for years to come, as shieks, mullahs, and George Galloways quote it as a respectable source from oddly-admired institutions. Watch al-Jazeera and MEMRI for the fallout, the slander that takes a moment to assert, and an essay to refute. UPDATE: In response to a reader request, I've added links to the original working paper (pdf) and to paul Mirengoff's original demolition of it. The schools in question are the Harvard and the University of Chicago. Since Walt and Mearsheimer appear to have gone to ground on this subject, I've also downloaded the article, and can send to anyone interested in reading it. The clock is running on how long it takes for them to recast their current cowardice as the effects of the "Israel Lobby" on free academic inquiry. Jimmy Rollins's hitting streak is over at 39 games. What was the 7th-longest hitting streak in major league history was also among the least celebrated. I remember two of the longer ones: Pete Rose's 44-gamer and Paul Molitor's 39-game streak. I remember both getting a lot more attention than this one. I think there are at least two reasons for this. First, the streak took place over two seasons rather than one. While I'm sure it must have rankled, I saw Rollins calmly discuss how he saw why some people might think that made the streak less interesting, he still believed that the record was the record. Rollins also pointed out ways in which it was harder to start up again in April, both with the weather and with the loss of momentum, but that's special pleading. It's hard either way. The one thing that Rollins had going against him, publicity-wise, was that at the beginning of the year, the teams are still sorting themselves out. Rose's and Molitor's streaks came when the seasons' story lines were already pretty well established. The other reason is what was called, with regards to Roger Maris, "baseball stature." I think there's a sense that the big records, the ones with emotional attachment, should be broken as part of a great career, or in the case of career stats, as the culmination of one. The people rooting against Maris were entitled, of course, although there's a difference between rooting for a record you love and sending hate mail. There's a much closer comparison to Molitor in terms of prominence. Molitor had been an All-Star twice, but had one of the best years of his career in 1987, the year of his hit streak. Strange though this may sound, Milwaukee also was a national stage at that time. He led his team to the 1982 World Series, where he batted .355, an opportunity that Rollins hasn't had yet. And one year (1987?) the team started out something like 35-5, incredibly failing to win the division. He also was consistenly ahead of the league in average, OBP, and SLG. Molitor was already a star, but his best years were still in front of him. These are probably Rollins's peak years. He's got little but speed, doesn't draw many walks, and doesn't hit for power. Ages 26 and 27 are the peak years for players, anyway, and players with only speed tend to decline quickly. None of this is necessarily fair, but four or five more games would probably have gotten everyone's attention. As a side note, while as a kid I remember trying to pick up KMOX (from DC!) to hear Molitor's hit streak, I was able to follow today's game on MLB. There was a time when these were free, on the streaming audio of the local stations. Then MLB apparently realized that they weren't squeezing every penny they could out of their fans, started claiming rights to the broadcasts, and centralized the streaming on their own site. Still, for $15, I can listed to three or four games a night, if I want, and tune in teams that actually have a shot at a winning record, and whose games don't take longer than Wagner's Ring cycle to perform. Not a bad deal. Everything else in the American League is either concluded or still going on. Six years ago, I took a short trip to go snowmobiling (no, not like that, or that) at Yellowstone National Park. I happened to hear a radio show with the then-newly-released-upon-the-world violinist Hilary Hahn. She played couple of pieces, which I liked, and the names of which I promptly forgot. Twenty years ago, this would have entailed tracking down the DJ, asking them to remember to look up the show manifest when they got back to the studio, and send me the playlist. In fact, it did just that, when I carried around the memory of a couple of unnamed but stunning violin concertos for 3 years. Now, it's a visit to the show's website, a search on Miss Hahn's name, and a swing by iTunes. In about 5 minutes I can track down and grab recordings of the music by various Eminent Performers, and then take them with me, if I so choose. I pay less for them than I earn while listening to them. Now, if I could just manage to get the household wifi to stay connected while encrypted, I could do all this on the patio. A review of Colorado's own Temple Grandin's Animals in Translation is here, and also available by extending this entry. It's quite good, but a little difficult to review. It's basically applied evolutionary biology, applied in this case, to your dog. Or your dinner. My dog doesn't like change. He likes the same morning routine, at the same time, all the time. He likes treats to be predictable, although he won't turn one down, ever. He knows the bedtime routine of treat-sleep. There are days he won't eat breakfast unless I give him his glucosamine pills first. When I get dressed, he assumes "walk time," even when I'm wearing a suit. I used to refer to him as, "my autistic dog." Animals in Translation, by Temple Grandin, seeks to explain animal behavior, from a special point of view - that of a very high-functioning autistic adult. Grandin's basic thesis is that her autistic brain functions similarly to that of animals, which allows her to think the way animals do. Of course, Grandin has most of the higher brain function of what she refreshingly calls, "normal people." The idea being that a translator needs to be fluent in both languages. Grandin may be familiar to some readers as Oliver Sacks's Anthropologist on Mars. She's the high-functioning autistic whose ability to empathize with cows has led her to design more humane equipment for stockyards and feedlots. (Don't think the irony of this escapes her; nevertheless, she eats meat.) As a teenager at a boarding school, she designed a "squeeze machine" to comfort herself, after noticing the calming effect that deep pressure has on animals. Animals in Translation is heavy on the brain chemistry, and hard on behaviorist theory. This doesn't mean that training doesn't work; if anything, it's intended to direct it more humanely and efficiently. it does mean that the state of the art has advanced so far past the black-box theory of B.F. Skinner that we've been locating brain function in specific areas and chemicals for some time now. If there's an overarching theory to the book, it's that the frontal lobes in autistic people don't work very well, mimicking the depleted frontal lobes in animals. The frontal lobes are what allows generalization, but that generalization comes at a price: the filtering out of a great deal of raw information. When that filtering doesn't happen, the brain gets overloaded; it's as though every sensory input is turned up to 11. Things that you and I would overlook, like a plastic bottle on the ground or a yellow raincoat, will bring an entire line of cattle to stamping halt on their way through a plant. Grandin sees things that way, too, which is why she can design systems to reduce the need for electric cattle prods. It's also a fascinating look at evolutionary biology. Dogs have been domesticated from wolves, of course, essentially turned into permanent wolf-puppies, and the brain structure comparison between the two are instructive. (You may never look at your dog the same way again.) What's more startling is the speculation that our close relationship with dogs - and our early dependence on their help - may have altered our own brain chemistry. Grandin is autistic, and while she's learned to string together enough phrases to simulate humor, one suspects that most of the cleverness comes from her co-author, Catherine Johnson. Still, the situational humor, the stories of neurotic animals (or neurotic owners) are all Grandin's, and can be very funny at that. While Grandin's favorite animals are also your future lunch, there's no evidence that she's laboring to include cats and dogs just to appease a wider audience. What little repetition there is serves to drill in the key points. If anything, it could use an appendix describing all the various brain parts and chemicals, and their presumptive functions; it's a shame to spend so much time wandering through the innards of your brain, only to discover that you can't remember as much of the tour as you'd like. Still, it's a pleasure to read, and anyone interested in getting to know their pet better could do worse than to start here. If she's not careful, young Rima Barakhat is going to acquire quite a name for herself. Probalby one she wants, but that the rest of us could do without. A little while back, I mentioned the visit of the Grand Mufti of Jerusalem to Denver, and Ms. Barakhat's somewhat, er, defensive reaction to the AJC and the ADL's calling an anti-Semite an anti-Semite. Since Ms. Barakhat lives in America, and not the Islamic state envisioned by the Mufti, papers like the Rocky often offer space for alternative viewpoints, and she took her chance to, well, change the subject. Today, the standards of Israeli-Palestinian political and religious discussions have been redefined by pro-Israeli organizations that are working amongst us. "Working amongst us." Ah, yes, those shadowy cabals, meeting in dark alleys and at Bingo Night down at Rodef Shalom. No doubt many of the Men's Clubs and all of the Ladies' Auxiliaries - not to mention most editorial boards - have been infiltrated, even compromised, by those "working amonst us." Soon, she'll be accusing doctors at Rose Hospital of infecting Muslim youths with AIDS. She goes after a translation here, a missed word there, not because MEMRI is wrong, but because they perform a valuable service. The imams and muftis they translate say one thing on Friday morning and another thing Sunday morning, and here, she perceives a threat. Sheikh Sabri, in his weekly sermon at Jerusalem's Al Aqsa mosque on September 12, 1997, declared: "Oh Allah, destroy America, her agents, and her allies! Cast them into their own traps, and cover the White House with black!" He repeated his accusations to other media outlets. "Six million? It was a lot less," Sabri told the Italian newspaper La Repubblica. "It's not my fault if Hitler hated the Jews. Anyway, they hate them just about everywhere. The Jewish people has found a formidable means of winning solidarity from the world." Wow, no wonder MEMRI thought he said all those terrible things. Jews have no right to Israel. Jews have to reason to be in Israel. Jews were lucky enough to have to the Holocaust to so they could get to Israel. These are not criticisms of Zionism; they're barely criticisms of Judaism; they're attacks on Jews. If Barakat wants to pretend that they're not, she'll have to perform contortions that I'd pay to see. Americans like tending to their own gardens, and I can't begin to tell you how much I hate having to write these pieces. I would rather be writing about baseball, design, business, or finance. I'd rather be photoblogging my latest roadtrip. I'd much rather be hanging out someplace warm trying to keep my attention on a good book in the face of delightedly un-burkha-ed babes. The fact that we have to spend time engaged in intellectual combat with people whose intellect stopped creating around the year 700, and who have a conveniently post-modern idea of truth, isn't just annoying, it's stealing my life, and yours. And next time, if they're as interested in getting along with Jews and Israel as they pretend, they could invite this guy instead. They might actually learn something. 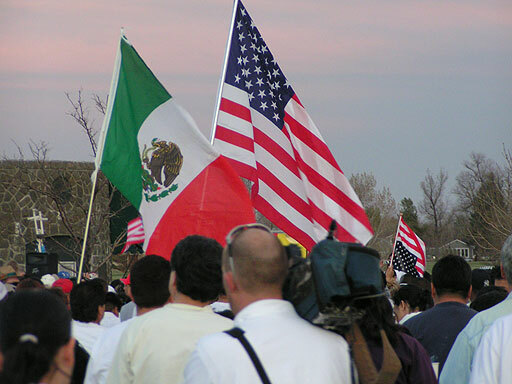 Skyline High School students walked out of class Friday morning to protest the school administration's new policy banning the carrying or wearing of American and Mexican flags. Most of the 100 students were protesting that American flags were included in the ban. Many of them were unclear about the policy, thinking that only American flags were banned, when in fact the ban covers the flags of both countries. The ban likely will be short-lived, lasting only as long as it takes for tempers to cool in the wake of Congress debating a contentious immigration bill, principal Tom Stumpf said. "The flags no longer were being used as symbols of patriotism or of cultural heritage, but of ethnic intimidation, harassment and blatant bigotry," Stumpf said. We are continually reminded that America is a country of immigrants, from all races and countries, and the flag is a symbol of that. So maybe Mr. Stumpf could explain exactly how an American flag could be used as a symbol of ethnic intimidation or blatant bigotry? 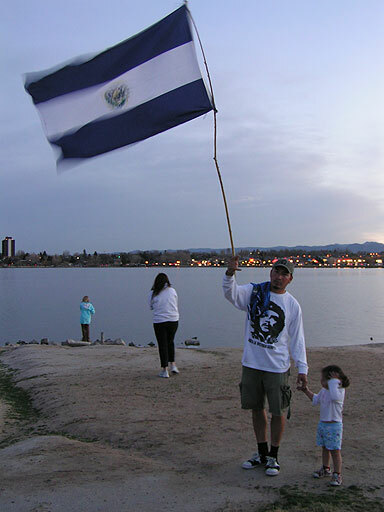 The ban includes T-shirts and other clothing that have replicas of the flags. At least for now, it also includes Mexican or American flags flown from the antennas of cars parked on school property. "My obligation is to secure the safety of students," Stumpf said. "The flags were being flagrantly misused to incite violence." A group of sophomores said the ban likely was precipitated by an incident in which a student with an American flag waved it in the face of an Hispanic student. The problem here is clearly with the student, not the flag. 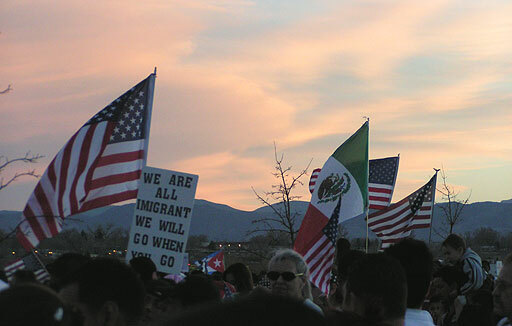 Rather than banning both flags, and thus lowering the American to the level of the Mexican on our soil, the administration should explain to the aspiring General Pershing that these "Mexican" students are American citizens just like he is. Oh wait, what's that you say? Well, now, that's another problem altogether, that sadly, the Supreme Court has decided our schools have no say in.